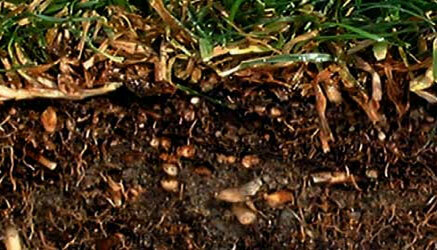 Fertilization: Organic Solutions Only Uses 100% Non-Toxic Fertilizer. 100% Non-Toxic. 100% Biodegradable. 100% Kid & Paw Friendly. Organic Solutions is a full service landscape fertilization and pest management company offering the OS Advanced Landscape Health Program through organic based fertigation. This innovative concept feeds the soil and plants with nutrients and amendments through the irrigation system, creating a healthy and sustainable landscape by saving water, fertilizer and pesticide use. By changing the soil biology and building the proper nutrient base is what allows Organic Solutions to maintain landscape quality at a high level yet using minimal water. One of our in-house certified technicians will perform an initial complementary full inspection of the property, including all lawn areas; as well as all plants, trees and shrubs. The current irrigation system will also be examined to determine whether efficient and effective watering is currently taking place. The inspection includes a selective extraction of soil samples throughout the property that is sent to a state certified laboratory for a thorough analysis to determine the overall quality and health of the soil. The lab results will assist our certified technicians in determining the precise blend of nutrients and amendments necessary to feed the property on a monthly basis. After considering the type of turf, plants and trees, type of use, source and quality of water and climatic conditions, we determine the most suitable Organic Solutions injector system that will be installed on the property. This on-site installation requires no upfront costs to the customer. Most system installations are completed in one to two hours depending on the size of the property. This includes a tank and a pump.The tank storing the nutrients can be above or below ground. Once the irrigation system turns on it sends a signal to the new fertigation pump, allowing the micro-dosing of nutrients to begin. The pump draws nutrients from the tank and injects them directly into the irrigation line providing continuous feeding at levels that encourage optimal plant growth to achieve maximum absorption. The slow and steady release of nutrients results in stronger, deeper roots. By developing a deeper, denser root system, plants are able to store more fertilizer and moisture, and are less susceptible to drought and disease. This results in increased water and energy conservation and in reducing the use of fertilizers and pesticides. Since smaller amounts of fertilizer are ap­plied and readily absorbed, combined with the use of organics, there is virtually no run-off that can pollute ground water. Once the OS fertigation system has been installed, the property is ready for the OS Advanced Landscape Health Program to begin! Once a month an Organic Solutions service technician will visit the property to perform the following tasks:Perform a visual inspection of the landscape in its entirety; treat for any pest problems; replenish the tank with nutrients and provide a report indicating property conditions and services performed. In addition, soil tests may be conducted at pre­scribed intervals. An Organic Solutions fertigation system is ideal for any type of landscape. This includes residential, commercial, and mu­nicipal settings and will work perfectly for your home lawn or for homeowners associations looking for environmentally and economically friendly solutions for neighborhood common areas. The system is also ideal for business storefront lo­cations, business complexes or campuses or for resorts and hotels. In the municipal setting: government building locations, community parks, and sports fields also greatly benefit from having an Organic Solutions fertigation system installed.